On my first day in San Juan, Puerto Rico, I took the free tram that circles Old San Juan and immediately got off when I saw this old cemetery. 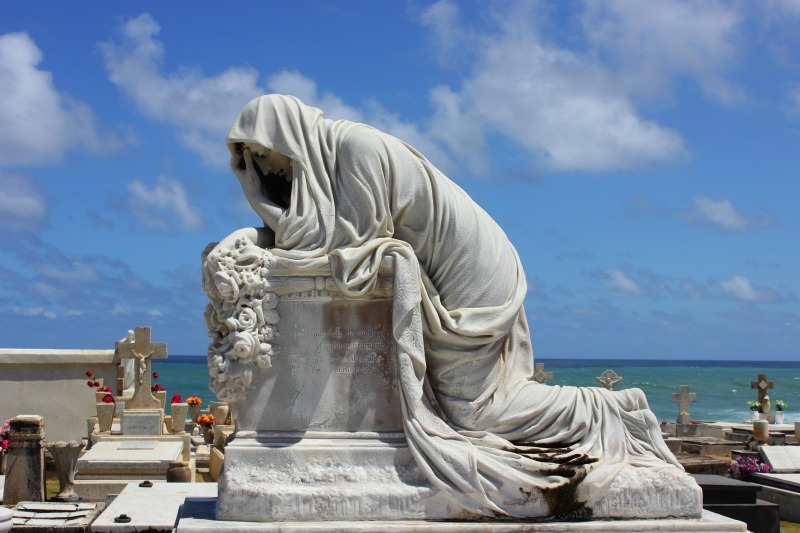 Located on the tip of the island facing the sea and below the fort, the Santa Maria Magdalena de Pazzis Cemetery not only features the grave sites of prominent citizens from politicians to entrepreneurs but also is a showcase of amazing statuary and sculpture. As I wandered the well-kept graves, I focused on this sculpture, an amazing lifesized figure of a woman kneeling in prayer. The folds of her clothing and the expression on her face were so well done – hard to believe she is carved from stone. With the contrast of the vivid blue sky and the sea, her presence stood out to me among the myriad of sculptures.